Padiham boss Liam Smith claims that recent changes at the club have been met with a positive response from his players. Seven new faces have now been added to the Storks squad as the management team looked to address the pedestrian nature of the team’s recent performances. 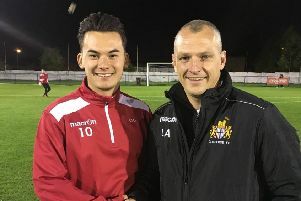 With promotion from the Hallmark Security Premier Division ultimately beyond them this season, Smith claims that a number of individuals had slipped in to their comfort zone. And as a result teenage centre-back Jack Sanders, Tunde Owalobi, Tom Williams, Burnley FC youth left back Kwasinkosi Mpofu, Marcus Burgess, Samuel Tattum, Josef Faux were all drafted in to give the group a proverbial kick up the back side. The transformation, it seems, had the required impact as Padiham pieced together their ‘best performance of the season’ to thrash promotion-chasing Runcorn Town at the Ruby Civil Arena. “We had some honest conversations recently about where we want to go and how we move forward,” said former Colne FC assistant Smith. “It gave the whole club a lift. “Some players were in their comfort zones and we don’t want that here. We want to challenge ourselves and finish as high as we can which will hopefully be in the top five. “We want to stand on the sidelines as a management team and enjoy watching our side play. He added: “It was a brilliant win and our best performance of the season by a distance. It was marvellous and we were completely in control. “We were magnificent and the new lads made a real difference and gave us that extra bit of quality. “There have been changes and I think that’s given everybody a kick up the back side to be better. It really paid off. “Runcorn Town got off to a flier in the league and they’re chasing promotion. We absolutely pasted them. “That shows that we’re capable of competing at that level and sends a big message out that we can beat anybody. Padiham also welcomed back defender Adam Freeland who had been sidelined for a month through injury. The centre back made his return known by scoring a hat-trick of headers in the 4-0 victory. “He scored a hat-trick of headers from set-pieces,” beamed Smith. “We do a lot of work on those in training so it’s good to see them pay off. “We’ve got plenty of routines and we’re proving to be really threatening from them. It was nice to see it work three times in one game. We were a constant threat and they couldn’t handle us. “Adam is a fantastic player and we have missed him. “It was his first game back and he’ll take all the plaudits for his goals but his all-round performance was superb. The Storks are scheduled to face AFC Darwen at the WEC Group Anchor Ground on Saturday with kick off at 3 p.m.